Seared Sea Scallops with Tomato, Red Onion and Balsamic Salsa is a light, elegant, summery restaurant-quality dish for two! Do you love sea scallops but think you can only enjoy them in a restaurant? I’ll admit, for a long time, dining out was the only time I ate them because I always heard how tricky they were to cook. We love scallops, but because they are expensive, I didn’t want to ruin them. These pricey pearls of the sea weren’t even on my personal chef menu because to ruin them would mean I would have to replace them at my expense. Then it happened. A client requested them because their life situation was such they could not eat out and wanted to enjoy one of their favorite restaurant items at home. Some “fear of the sear” set in on my part. If not done properly, scallops won’t brown or can stick to the pan. Rather than panic about possibly ruining the scallops, I turned to my trusted Calphalon nonstick cookware. The result–scallop success and happy client! 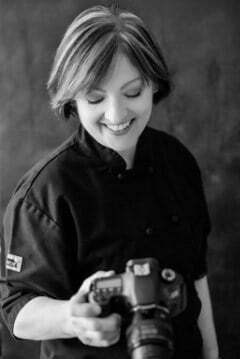 I’ve used numerous brands of nonstick cookware in my career as a personal chef and none hold up as well as Calphalon. I’ve used it now for a number of years in my business and at home and when asked about nonstick or stainless steel cookware, Calphalon is what I recommend. As if their existing lines of nonstick cookware didn’t already rock, they just released Calphalon Signature™ Nonstick cookware. Wow. In my line of work, cooking equipment gets used pretty hard. However, with Calphalon I don’t worry because they back all their cookware with a full lifetime warranty. You won’t need to worry about “fear of the sear” when using this cookware. Only Calphalon Signature™ Nonstick combines the convenience of nonstick with stainless steel performance and durability for professional results. This gorgeous cookware has the ultimate nonstick surface that holds up to metal utensils and it’s even dishwasher safe. Calphalon Signature™ Nonstick, along with their stainless steel cookware is available at Bed Bath and Beyond. Check it out at Bed Bath and Beyond – Calphalon. You can order it online for convenience or find it at one of Bed Bath and Beyond’s many stores. 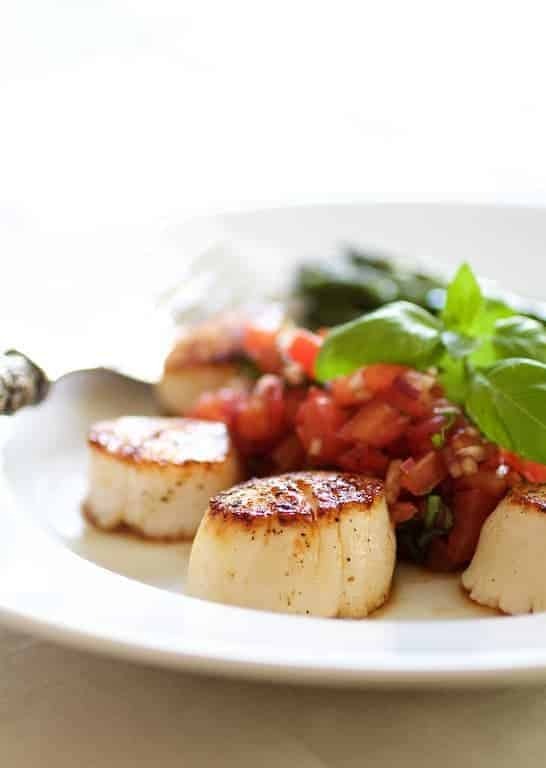 Before heading to the store for scallops, here’s some important information on purchasing, handling and how to get a proper sear. Bay scallops (on the left) are small in size and are best used in a soup, stew or pasta dish. The sea scallop (on the right) is the one you want for this dish and to sear. 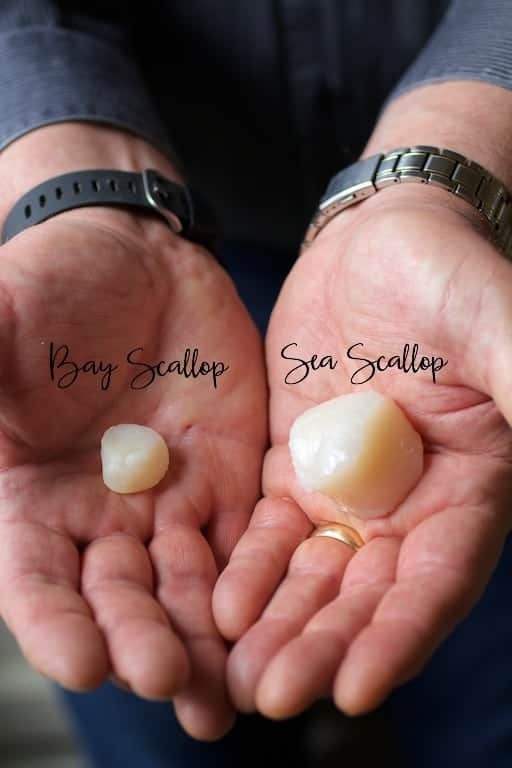 The best way to keep them straight is to think of the body of water in their name: A bay is smaller than a sea, therefore a bay scallop is smaller than a sea scallop. Diver scallops are carefully hand-harvested [by divers] and are the highest quality. Most scallops sold commercially, however, are mechanically harvested. That’s not a terrible thing, but because of that, they may contain sand. Scallops purchased fresh from a reputable source are always best. However, I’ve had good luck with packaged frozen sea scallops–you just need to know what to look for. 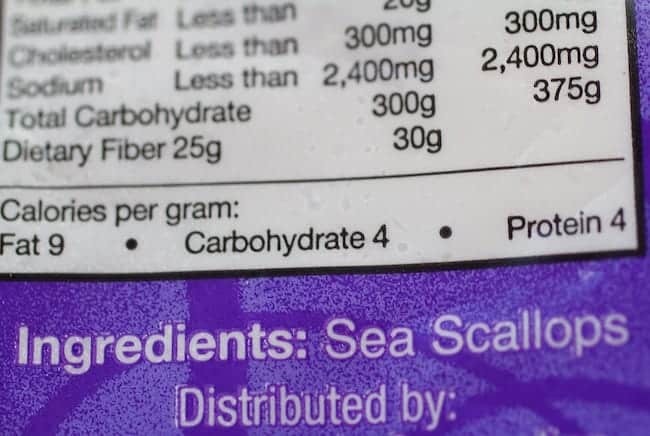 Make sure sea scallops are the only ingredient listed (untreated are generally referred to as dry-packed). 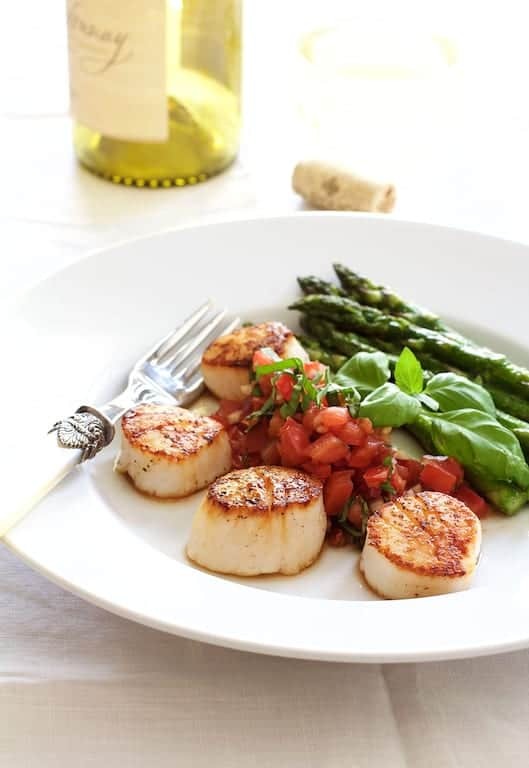 Avoid scallops treated with sodium tripolyphosphate (STP) or any other chemical (treated scallops are referred to as wet-packed). This treatment causes the scallops to exude a substantial amount of liquid when put to heat, making them difficult to brown. Wild caught from the USA is always a good idea with any fish or seafood! Once you have the correct type of scallop, some minor prep is important. 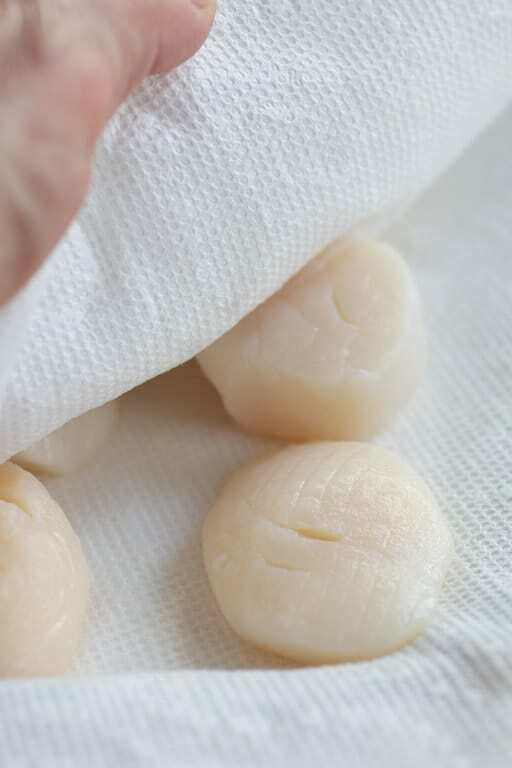 Frozen scallops should be thawed uncovered overnight in the refrigerator on a plate lined with paper towels to wick away moisture. 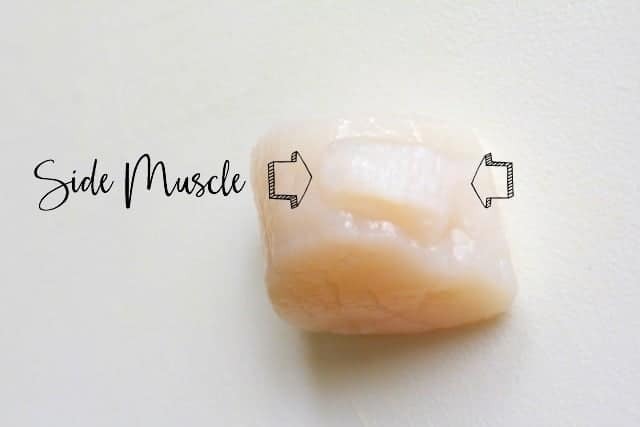 After removing the side muscle, give the scallops a quick rinse under cold water. If any sand is hiding, this quick rinse will help dislodge it. 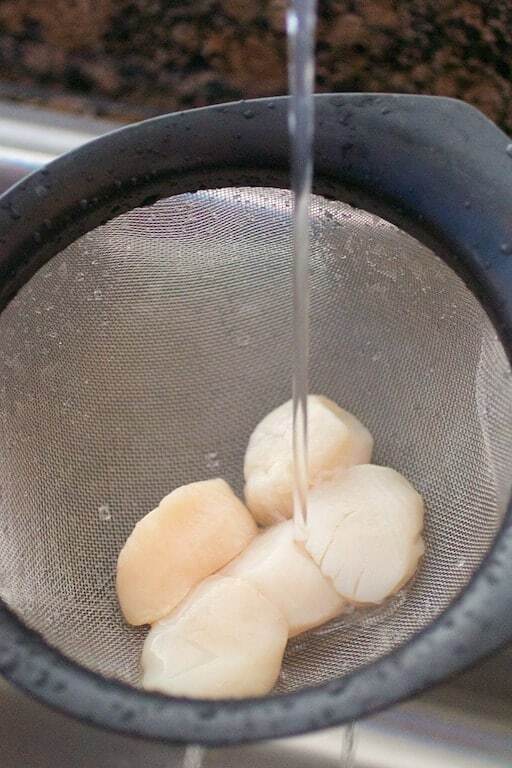 Don’t soak or overdo the rinsing as scallops already contain a fair amount of water. Over-rinsing or soaking can ruin the texture of the scallop. Pat dry with paper towels and you’re ready to cook! Start with a pan that allows plenty of room so moisture evaporates quickly. Crowding a pan with any protein causes the protein to steam rather than brown. The Calphalon Signature™ Nonstick 12″ Omelet Pan is the perfect size for two servings of scallops. Heat a small amount of oil in the pan over medium-high heat. 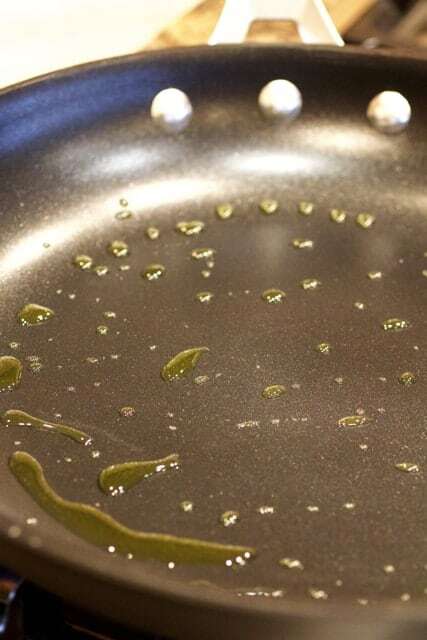 (Because of Calphalon’s superior nonstick surface, you do not need very much oil, making whatever you cook healthier.) The oil should be quite hot, shimmering and ready to smoke. 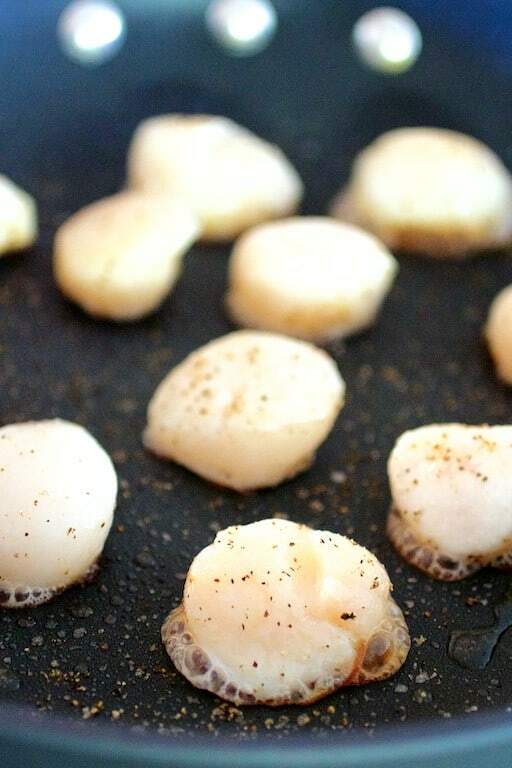 Season the scallops generously with salt and black pepper…..
….And you’re ready to roll! Gently place the scallops in the pan. Here is where patience is a virtue: Do not flip the scallops until you’re confident a golden brown crust has formed. This will take two to three minutes. Then, being careful not to disturb the scallops too much, do a quick peek underneath the first scallop you placed in the pan to see if the golden brown crust has formed. When the crust has formed, gently flip the scallops and cook briefly on the other side–about one minute. 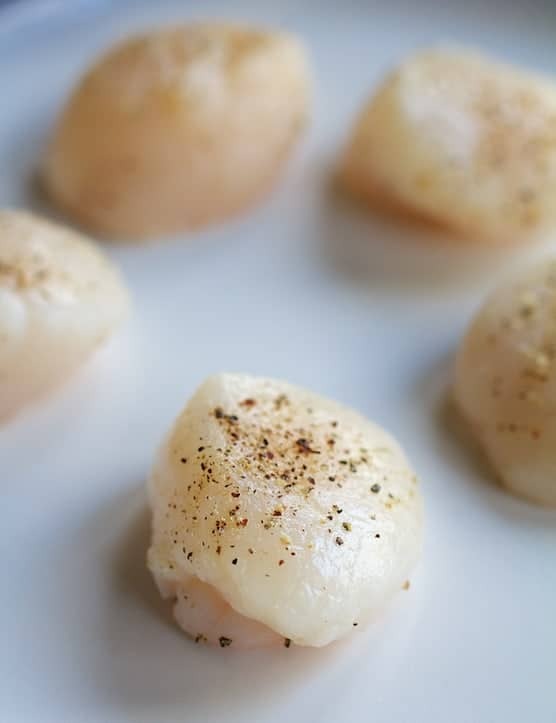 Scallops are cooked properly when they are just slightly firm to the touch and go from translucent to opaque. There will be a small amount of carryover cooking, so it’s best to take them off the heat a bit early. In the case of scallops. undercooked is better than overcooked. How beautiful are these scallops? 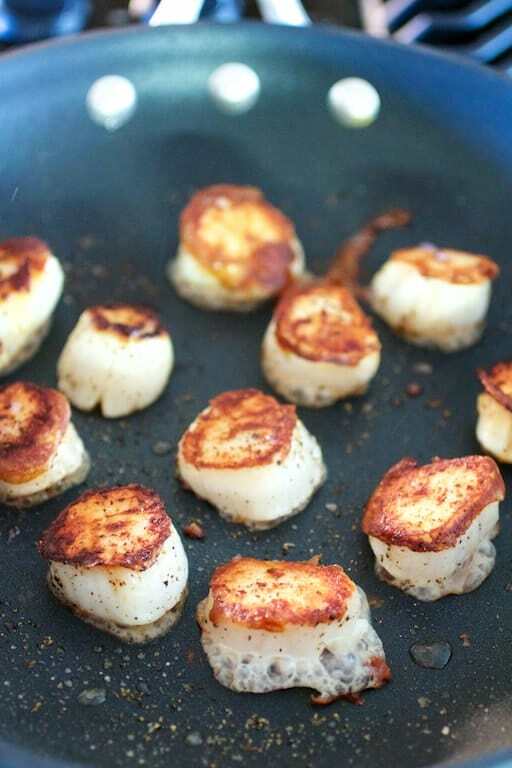 Scallop success again with the Calphalon Signature™ Nonstick! Now…. onto this light, elegant restaurant-quality dish for two: Seared Sea Scallops with Tomato, Red Onion and Balsamic Salsa. Sea scallops have a slightly sweet, slightly briny flavor. When seared, this distinct flavor only needs to be complemented–not covered up. The mild acidity of tomatoes and balsamic vinegar in this bruschetta-inspired salsa is the perfect pairing with scallops. 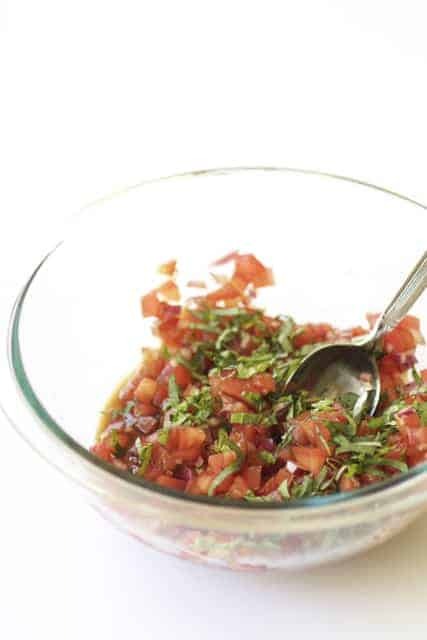 I like to use plum (or Roma) tomatoes for this salsa because they keep their texture when mixed with the balsamic vinegar. 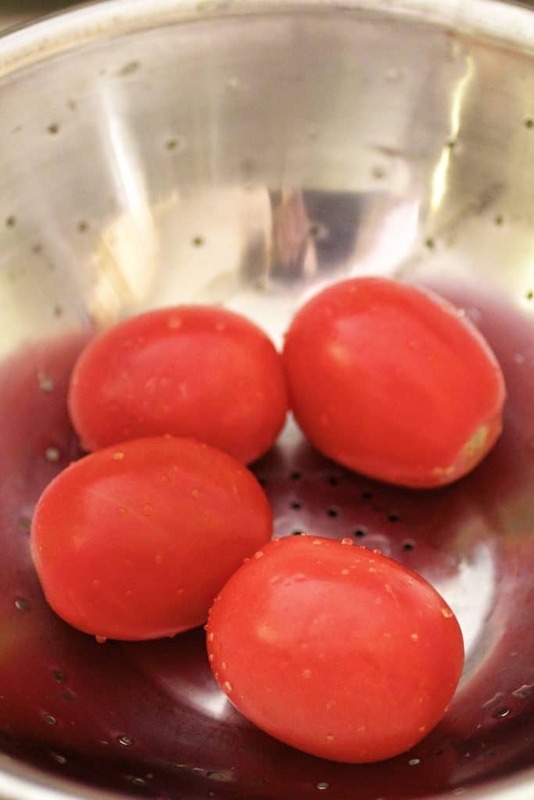 Plum tomatoes are also one of the few tomato varieties of decent quality available outside of summer tomato season. Make the salsa before searing the scallops then add the fresh basil just before serving. 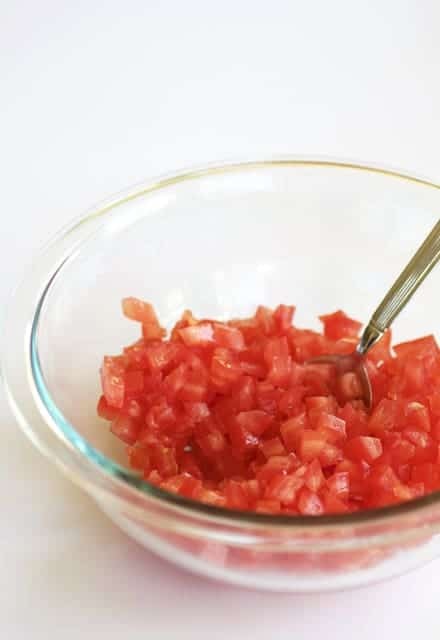 Combine tomatoes, onion, balsamic vinegar, salt and black pepper in a small bowl and mix well. Set aside. When ready to serve, stir in fresh basil. Heat olive oil over medium-high heat until oil is hot, shimmering and ready to smoke. Generously season scallops with salt and black pepper. Place in the pan and cook 2-3 minutes on the first side or until a nice golden crust has formed. Turn the scallops over and cook 1 minute on the other side. Immediately remove from heat. Not to toot my own horn but I can really get my seafood to shine BUT scallops.I’ve made them twice and they were so-so. Your tutorial has given me the incentive to try again. You’re right — they are expensive so that’s why we’ve held off. I love sea scallops. I’ll give it another go and see how it goes. One other recipe my sons make MUCH better than I do — guacamole. 🙁 Anxious to try this recipe — thank you. I love scallops and I will surely try to make them this way! Great tutorial! Thank you, Carol. Such a clear, easy to read tutorial, and the resulting dish looks mouthwatering. I LOVE scallops!